The blockchain is a revolutionary tech with the potential to effect massive changes. However, the current version is not end user-friendly and it performs inconsistently. Additionally, it is expensive to maintain and there is no interoperability between different kinds of platform on the blockchain. The problems outlined above are what the ArcBlock platform seeks to address. ArcBlock wants to remove the barriers that currently makes the blockchain hard to adopt for the general public. In doing so, they want to significantly boost adoption of the tech while creating a fresh platform for developers and their applications. 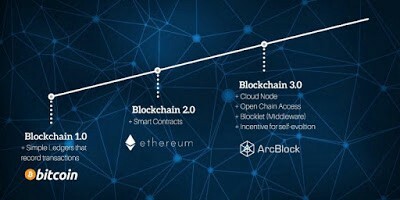 ArcBlock is a 3rd generation blockchain tech and it offers developers the frameworks and tools to aid them in the creation and development of their own ecosystem and decentralized applications (DApps), allowing over 100,000 transactions per second. ArcBlock’s technological milestone is an Open Chain Access Protocol as well as the Blocklet, meaning devs can combine multiple blockchain solutions in their applications. Going further than other similar platforms, ArcBlock also supports cloud computing. As a result, a node can be run both on a “logical computer” as well as a group of cloud services. Furthermore, unlike most other competing platforms where end users pay the transaction fees, the same is not the case on ArcBlock. Rather, the platform pays its users, further improving end user experience. This overall cost is borne by developers and every month, they pay ArcBlock in ABT, the governing token on the platform. ArcBlock’s token, ABT maps to ERC20 tokens 1:1, simplifying the exchange process and making it possible for the developers to benefit from the existing Ethereum ecosystem. There will be a total of 186 million ABT tokens, and 45% of this total is to be put up for sale. The remaining 55% is shared thus: 15% goes to the team, 32% is reserved for miners and the ArcBlock community, and the final 8% is earmarked for marketing and for their partners. The hard cap for ABT private sale is pegged at 25,000 ETH, and for the public sale, there is a cap of 12,500 ETH + 6,000,000 CMT (CyberMilesToken). In total — and depending on the values of ETH and CMT going forward — ArcBlock aim to raise ~$45million for the 45% token share being put up for sale. During the private sale, 1 ABT = 0.0004873 ETH. In comparison, the public sale rate is expected to be in the region of 1 ABT = 0.0005263 ETH. The CMT/ABT rate will be announced shortly before the public sale starts. ArcBlock (future Blockchain 3.0) is a platform and system for building and running decentralized blockchain apps. Stage goes through important segments that are expected to utilize blockchain to strengthen complex business rules. It connects the existing framework with the blockchain system, empowers you to computerize business forms by utilizing information and personalities related to the existing framework. What is the purpose of arcblock? The purpose of ArcBlock itself is to drive out the blockages that have moderated the acceptance of blockchain among the entire population. We also want to build an approach that will at all encourage increased blockchain. ArcBlock is a push-based market for administration, segments, and even reusable applications. “Mineworkers” at the ArcBlock stage not only brings processing assets, more than that it helps build a shared stage by providing reusable segments, new administration, and even ready to send applications. Individuals who provide assets or administration will be paid with tokens to frame a thriving, positive and independent stage that continues to grow independently from others. The benefits of the ArcBlock stage are not our own special creations. It’s produced by the ArcBlock people group that we just started another blockchain riot. Building and running a decentralized blockchain application with ArcBlock has a very important situation regarding the currently available systems available. ArcBlock is a biological community that promotes itself not only the product stage undertaken by the united association. We at ArcBlock, Inc. furthermore, ArcBlock Foundation is just starting a business; Stage will proceed to develop and create independent from others. All ArcBlock administration is driven by token economy. Rather than the basic administrative stage, ArcBlock is a power driven economy that encourages blockchain groups to work together to gather better biological communities. We build the ArcBlock stage using the “best down” procedure that focuses on client meetings. On the other hand, many of the existing arrangements concentrate on blockchain innovation itself thus harming ease of use. Applications that work with ArcBlock offer a receptive and persistent grip. Clients can only access them from web programs (no additional modules are required), or download portable apps directly from the app store. Both ways, the procedure is not far away. ArcBlock also drastically increases engineer engagement. There is no compelling reason to manage a lowlevel blockchain convention. With our built-in blockchain connectors, engineers do not have to run around near block blocks to start creating and testing their apps. ArcBlock is meant to run locally in the cloud. It can also continue running on one PC for testing and progress. The rules of this plan make ArcBlock in the general sense not the same as the many different stages in the blockchain world. In ArcBlock, a hub can be a “coherent PC” consisting of at least one virtual machine, or a set of cloud benefits that work together as a decision-making situation. This approach shows noteworthy advances that will help improve blockchain and decentralization applications to the next level, including patent pending innovations. ArcBlock will initially be based on AWS and Windows Azure, at that time expanded to help Google Compute Engine, China’s leading computing player, and different stages. Working with Open Standards ArcBlock works with open principles. We try not to reinvent the bargains that fabricate the desires and needs of application engineers. While opening up some of the central assets, we will also effectively increase the blockchain innovation group. Our co-workers are effectively required with associate guides, charities, and panels. Currently includes Community Blockchain W3C Group Community Community, Community Standard Blockchain Standard, Ethereal Enterprise Alliance, Linux Foundation, and Hyperledger Foundation. This rundown will progress after some time. ArcBlock Token (ABT) is the first ArcBlock stage. To achieve a high performance exchange, we create an ideal blockchain committed to ArcBlock token administration and open records. The goal of the plan is to achieve> 100,000 Tx / s, which is all that may be required for a wide range of utilization. Later this blockchain can be redesigned for a broader reason. ABT is structured as a useful token that can be widely used as part of various situations. At ArcBlock, ABT’s essential utility estimate is to pay the cost of using ArcBlock framework. Like the distributed computing administration, ABT is a utility token to pay fees associated with the use of this administration. In contrast to Ethereal or Bitcoin, where clients typically pay a fee for every exchange they make, ArcBlock is intended to allow app suppliers to pay exchange fees for their end clients. This approach greatly enhances client meetings. Designers pay month by month, allowing them to enter small units and spare cash. ArcBlock also asks the designer to extract a number from an ABT token such as an offer when they require basic mission administration. ArcBlock’s private sale is currently ongoing, and registration for that sale has closed. However, there will be a public sale and it is slated to start by 7 p.m. (CST) on the 3rd of February, 2018. As at the time this post was published, ArcBlock had over over 43,000 Telegram users, nearly 15,000 followers on Twitter, 6,000+ Facebooksubscribers, over 950 Reddit readers, and 390+ followers on Medium. CEO at NetEase, one of China’s leading internet companies for almost 13 years (till present). Chief Growth Officer at RChain Holdings. According to Howey’s Test conducted by our analysts, it is unlikely that ABT will be considered a security. Co-founder, and CEO of PixoMobile, a start-up that creates iOS-based photo processing applications, for almost 5 years. Co-founder, Director, and Board Chairman at Seattle Entrepreneurship Club for 3 years. Worked as Research Software Development Engineer at Microsoft for 3 years. No team member with notable target market expertise. PR Director at iDriver Media for almost 5 years. Deputy VP at Cyzone for one year. Principal at Carney Badley Spellman P.S., a medium-sized private law firm for over 2 years. Partner at Davis Wright Tremaine LLP, a law firm, for almost 8 years. Worked at Microsoft for 3 years as Research Software Development Engineer. CTO at Trezeo, a freelancer payment platform, for almost 2 years. Worked at Microsoft for 4 years as Software Development Engineer. Founder, and CEO of Coinprism, the first colored coins web-wallet, for over 3 years (ongoing). Founder, and CEO of Predictious, a Bitcoin prediction market, for almost 5 years (ongoing). No team member with notable expertise in token economics. However, Flavien Charlon has been working on blockchain-related technologies/projects since 2013, hence, it can be assumed that he knows one or two things about token economics.